Here goes a stocking stuffer for you hip hip heads this holiday season, from the good elves at BITM. 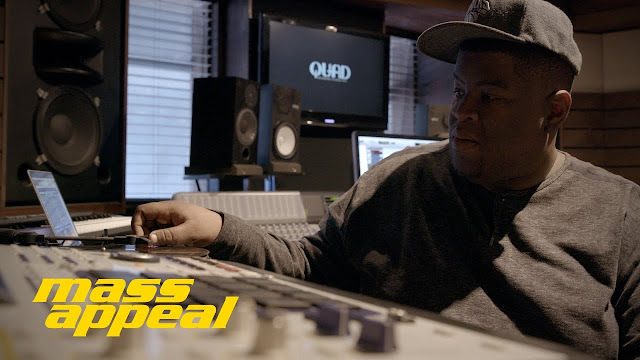 Last month's Rhythm Roulette episode featured Queens, NY producer Salaam Remi. Most of uall might know Salaam from his work with Nas, Amy Winehouse, Estelle or Alicia Keys; but the Queens beat maker also has production credits with Ini Kamoze, The Fugees (from el clasico, The Score), Black Sheep, Jurassic 5, Biz Markie, Beenie Man, Big Boi, Blaque, Ludacris, Carlos Santana, and a slew of other artists. The ageless wonder somehow also has keyboard credits on Kurtis Blow's Kingdom Blow (which came out in '86!). Salaam's sound ranges from soulful R&B to straight grimey NY hip hop, and throw in some Spanish pop and reggae to just totally confuse you. He might be the producer with the widest range from the Rhythm Roulette series that we've posted here. Salaam hit up Manhattan's A1 Record Shop to blindly pick his three records. Remi then hit up his studio from the future with: George Faith - Soulful, Danny La Rue - Danny La Rue In London, and The Who - Meaty Beaty Big and Bouncy. The expression on Salaam's face while playing the first record (by Danny La Rue..which is a musical LP..like stage musical musical) is hilarious. In addition to that, Remi's George Faith pick comes from the reggae genre. But this veteran stays unfazed. Again, we see yet another amazing producer go to work and create another banger. Salaam creates his beat using every sample he could get, adding very little beside an extra kick drum or two. We even get a brief cameo from Joell Ortiz doing his best CeeLo Green impression. Normally I say something like, "if you're a Salaam Remi fan, you def need to peep this". But honestly, it is almost impossible to not have heard any track that wasn't created by Remi. So you are probably a fan and didn't even know it. Either way, peep the video below.